Nick Quarm Dark Ambient The legend that is Robin Storey has just released what must be his fiftieth album ( 30 under the monicker of the legendary Zoviet France, and at least 20 as Rapoon). 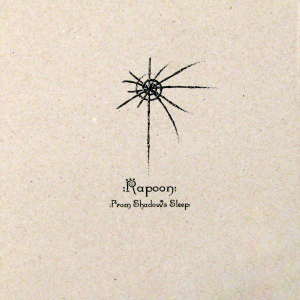 Rapoon (for the uninitiated) is a legendary Dark Ambient project, pushing every release to boundaries and inspiring almost any band you can think of. "From Shadows Sleep" is a perfect example of ethereal wonder from the moment you get the packaging. Everything Such attention to detail is incredible. These paintings are marked with the same kind of obscurity and abstractism that endear Rapoon to so many fans. Bleak and fading pieces of art, much like Picasso paintings - always hard to identify, but as soon as you listen to the music they become crystal clear. Also interesting to note that every track begins with "The" - a Rapoon trademark. Instantly, from the first second, this album astonishes. Sounds so pivotal and instrumental to the genre that one wonders how some people have never heard Rapoon! The Ghostly feel to this masterpiece is echoed by the illuminative and deathly feel to the Paintings that come with it. Ethno-Ambient isn't even close...there is a whole chorus of Spirits performing on this album, uncredited and hidden. There is always an element of primeval and otherworldy echoes to Rapoon's music. Tracks like "The Pit Under The Castle"> devour all light and deliver wonderfully dulcet undertones, and the overall feel is the same kind of purity one could only get by staring at a Crystalline Empire bathed in the light of the Moon. let us reference "The Fall of Babylon" - a gritty, hostile number, which can almost be a faint Vacuum sucking up life. Part of the Brilliance here is that the tracks meet the stories that their titles hint at, and the paintings only further this notion, taking the listener into an entirely new train of focus. There are so many tracks here that leave me with such an inspired outlook I just do not know how to describe them. "The Endless Plains" is amazing. Lengthy, remorseless drones, metallic cries, and a general feeling of totally despondency. Track of the album has to be "The Cold Sun Rising". Distorted instruments (maybe Brass, maybe Horns), almost Satanic in their Witchery, perform a deeply unnerving cacophony before a few changes of pitch and tempo. Like looking at the entire world through a Bleeding Black Sky. Musically, this automatically wins as a trademark and necessary album. With the entire package, this is a STRONG contender for album of the year. The legend that is Robin Storey has just released what must be his fiftieth album ( 30 under the monicker of the legendary Zoviet France, and at least 20 as Rapoon). Anyone reading this review that doesn't want to hear this album is not a Dark Ambient fan.